Professional Sanitizing Solution Keeps caterpillars alive Naturally ! $ 6.00 for 2 oz bottle. Discount at 5 or more. $10.00 for 8 oz bottle. Discount at 5 or more. $50.00 for 100 Ounces (100 oz) Discount at 2 or more. THIS IS AN ESSENTIAL PRODUCT! Are you ready to raise a bunch of caterpillars? You need to keep things clean from the moment the eggs are laid! This solution is worth 50 times its price as it saves livestock from all sorts of yucky diseases with NO side affects! It actively kills all bacteria, mildew, mold, single celled organisms and even viruses. You can even spray it directly on the caterpillars without worry. No smell, safe to handle, and lasts a long time if used correctly. Comes with directions and our experience raising very healthy stock with a 95% healthy adult ratio from original egg. Impressed? If you have ever raised Monarchs in quantity you would be! We are the Live Monarch Foundation, we care about caterpillars and want you to have the best possible experience. This is a Live Monarch exclusive professional product! A blend of Homeopathic remedies to Help aid in the suppression and elimination of paricites, bacterial infection and common illnesses. Caterpillars seem to be unaffected by direct contact and our tests show a clear benefit. Just spray their leaves 2-3 times during their lifecycle and they will eat their proper dosage. This is a specialized product and while very safe should be handled with care. Please report your findings to us so we can better document the effectiveness of this product. May be fed to adult butterflies as well, mixed in, or sprayed on their nectar source. While it can not always save a very sick caterpillar it will save you from many problems before they grow into disasters. Need more information? The "sanitizer" is a specialized form of highly purified steam distilled water to which a titrated concentration of silver in liquid suspension has been added through electrochemical means. This nano silver colloid is 10 parts per million and has an ionic charge giving it the enhanced ability to bind with and have a toxic effect on living algae, molds, spores, fungus, virus, prokaryotic and eukaryotic microorganisms, even in relatively low concentrations. It is photosensitive, fully active for 12 months - up to 2 years if kept in dark...In direct sun will darken over time. Less effective in darker state. For the layman: Spray lightly on everything that comes in contact with your subject. Spray on visible problems or suspected areas of contagion to saturation. Active components still active upon drying...long term antimicrobial surfaces created. Silver will not create more virulent strains of bacteria like some antibiotics. We spray our hands, cages, caterpillars, all food plants, their frasse and most of our work areas at regular intervals....used lightly as a prophylactic and heavily if problems are noticed. While nothing can protect from everything due to the mode of infection for all pathogens, we attribute at least an 80% greater recover / health rate for living creatures in our care. Our primary focus is Caterpillars with relatively simple digestive systems and little immunity defense. $ 16.00 for each Mini-Microscope. Discount at 5 or more. 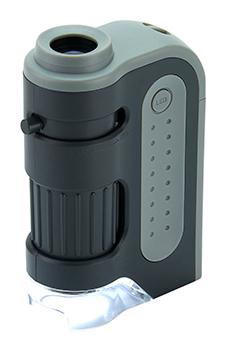 This is a powerful 60-120x magnification microscope with an extremely lightweight and portable design. It features a built-in LED light that provides a bright, clear image and a rubberized eyepiece for comfortable viewing. It will easily fit into your pocket to bring with you anywhere. Comes with batteries and instructions for use. Perfect for investigating possible pathogens and parasites. With this microscope, you can finally tell exactly what is going wrong with your caterpillars and quickly fix the problem. Size: approximately 4 inches tall. Makes an awesome gift or perfect classroom tool. watch the video below for instructions.